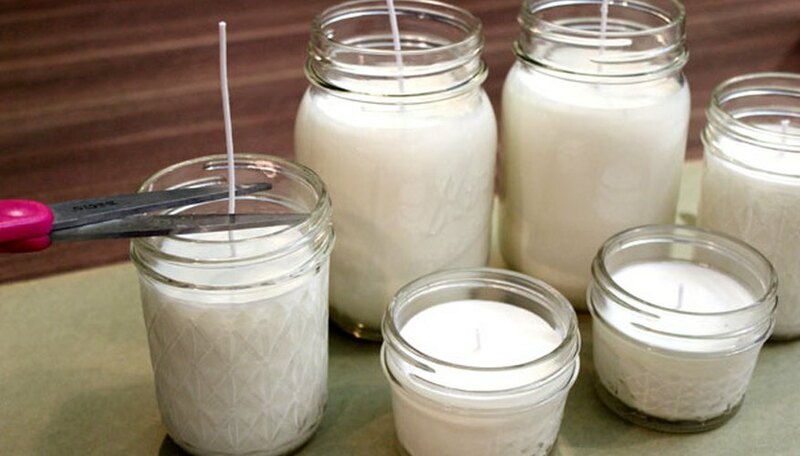 Making your own custom candles is surprisingly easy, and they are a fraction of the cost of store-bought candles. 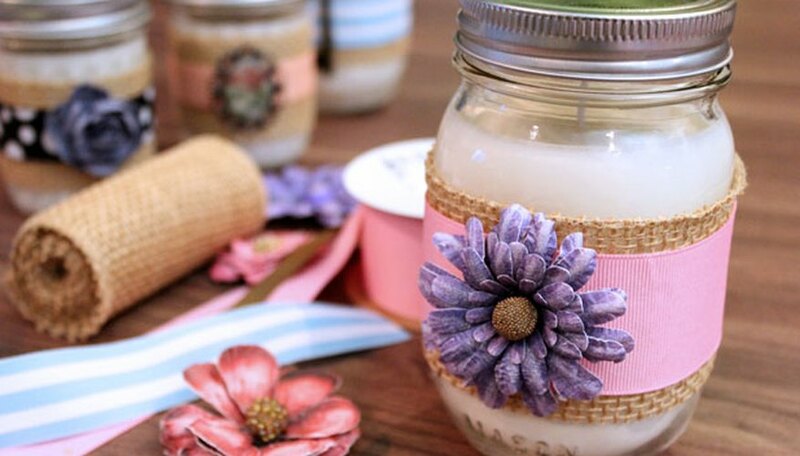 These hand-poured candles in mini-mason and jelly jars, decorated with burlap and embellishments, make perfect gifts for birthdays, housewarmings, Mother's Day, or any occasion. Just remember to make a few extra to keep for yourself. Candle-making supplies, like the ones for this project, are available in crafts stores, but the selection is greater and more affordable from online candle supply shops. 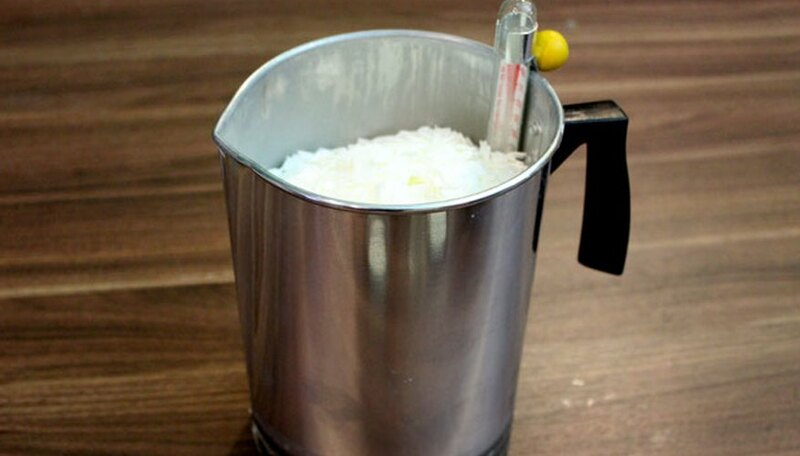 Fill an aluminum pouring pitcher with your desired amount of wax flakes. I chose soy wax flakes because it burns cleaner than paraffin wax, without the soot or harmful chemicals. Place a candle thermometer in the pitcher as well. 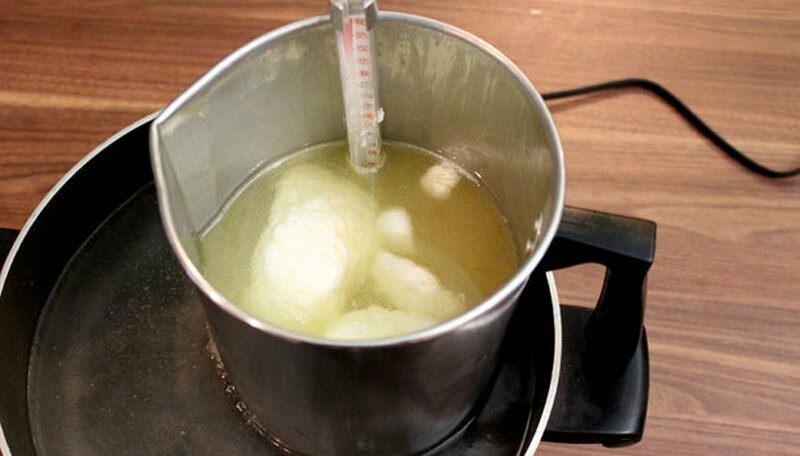 Place the pitcher of wax in a pot of water to create a double boiler and turn on the heat. Use the thermometer to stir the wax occasionally as it melts. The wax has two significant temperature points to look out for: The heating temperature, which is the actual temperature you want to heat the wax to, and the pouring temperature, in which you've removed the pitcher from the hot water and cooled the wax slightly before pouring. The packaging of your wax will recommend these temperatures. For my wax, I heated it to 150 degrees and poured it at 125 degrees. When the wax reaches the recommended heating temperature, add some candle fragrance, if desired. Fragrance oil comes in small vials. Use about one ounce of fragrance per pound of wax, varying the amount depending on your personal preference. While the wax is melting, place the wicks in the mason and jelly jars. Online candle supply stores carry wicks of different thicknesses for different sizes of containers. They also carry pre-tabbed wicks, in which the metal tab at the bottom makes it easy to adhere to the containers. Place a glue dot at the bottom of the tab and press the tab to the bottom of the container. 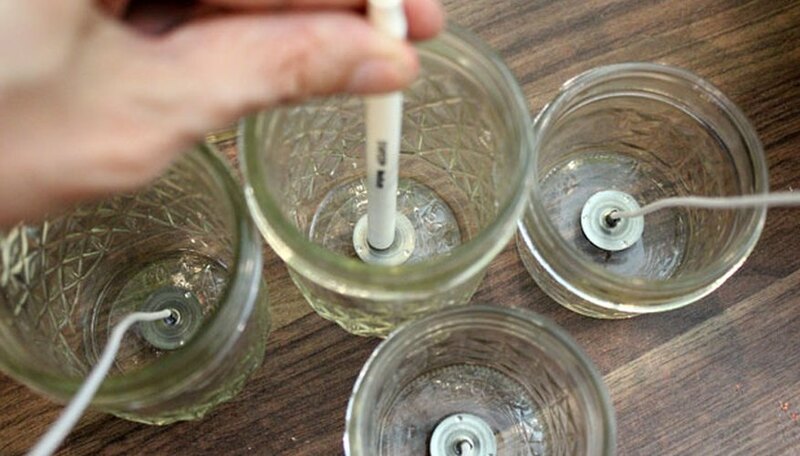 To make it easier to get the wick in taller containers, place the wick through a hollowed-out pen to position the wick and press it into place. To keep the wicks upright, place some masking tape across the top of the containers, cut a slit through the middle of the tape, and slide the wick through the hole in the tape. Pinch the tape to hold the wick in place. When the wax reaches its pouring temperature, pour the wax in the containers. Do not worry if you get some wax on the rim of your container. You can remove it after it hardens. Let the wax sit undisturbed in the containers for at least 24 hours or the wax may crack. Even when the wax hardens and turns white, it could still be liquid in the middle, so wait the full 24 hours before moving the candles. 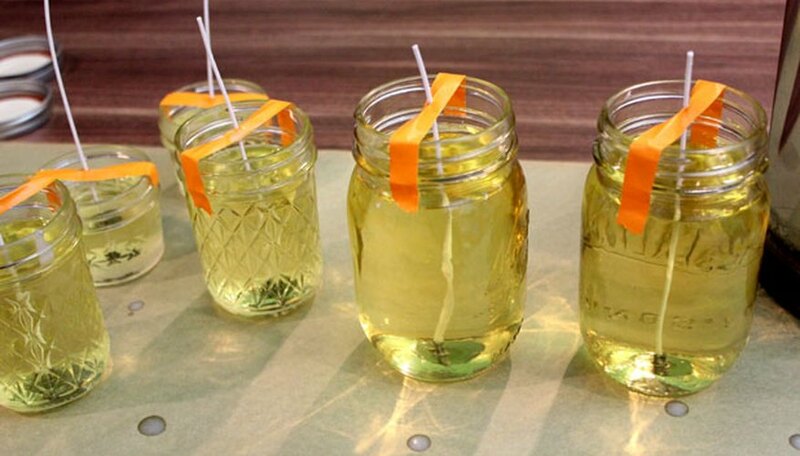 Cut the excess wick from each candle. Then screw the lids back on the jars. The fun, creative part of this project is decorating the jars. Start with a wider burlap ribbon, layer a fabric ribbon on top, and then finish with a floral or jewel embellishment. These embellishments are available in the scrapbooking section of crafts stores. 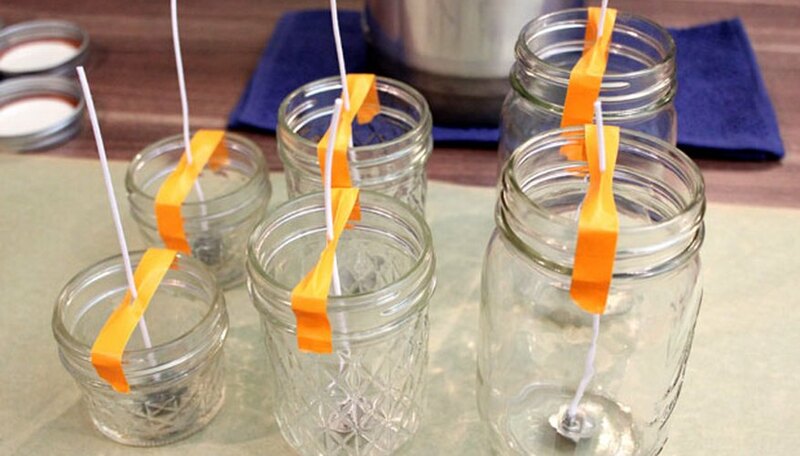 Use a glue gun to adhere the ribbon and embellishments to the jars. You can also use let your imagination run free and decorate the jars with whatever materials you have around the house. If you do not use all the melted wax, just leave it in the pitcher. 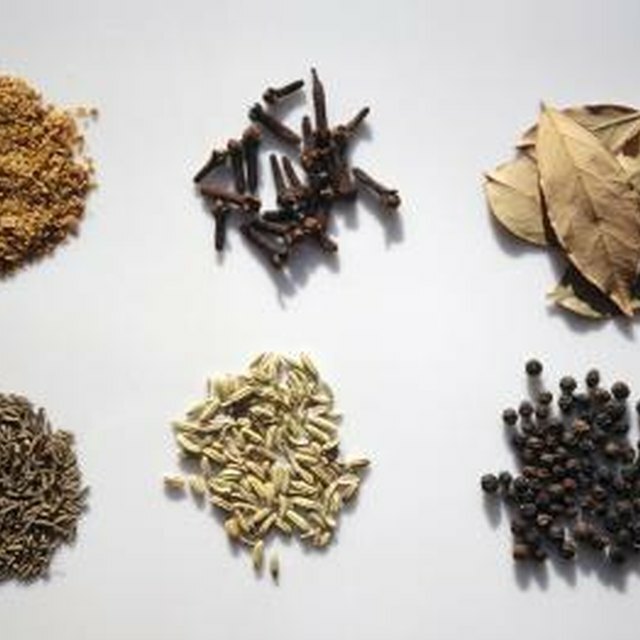 It will harden in the pitcher, and you can use it for your next project. 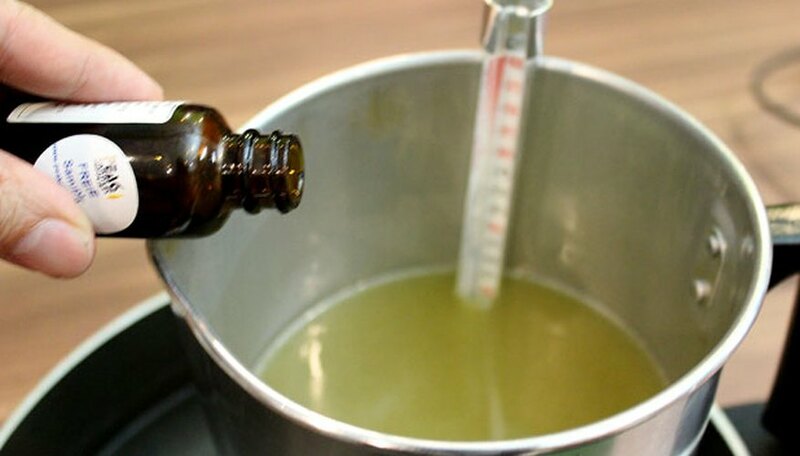 You can also add candle dye to the melted candle wax at the same time the fragrance oil is added. This project uses hot water and hot candle wax, so keep children away during the melting process.